Kevin Lynch takes over at a club which was relegated from the Conference North at the end of the 2014-15 season. 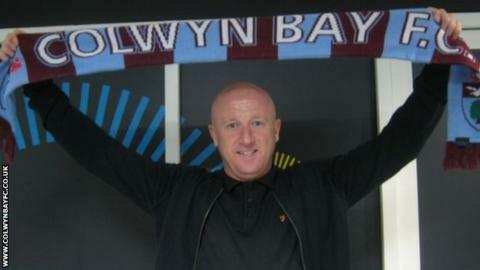 Evo-Stik League Northern Premier Division side Colwyn Bay have appointed Kevin Lynch as their new manager. The 40-year-old replaces Ashley Hoskin, who left the Llanelian Road club only five months after succeeding Gus Williams. Former Southport player Lynch has previously been Chesterfield first team and senior development coach. He takes charge of a team currently 20th in the table and who are away to Rushall Olympic on Saturday. "Its a really tough start going straight into two away games in three days, but I wouldn't have taken the job if I didn't think I was up for the challenge," Lynch told the Colwyn Bay website. "It is going to take a little time to work with the players, access them and get their fitness levels to where they need to be to play the football I like to play. "But its not all about me. It doesn't need a rocket scientist to know the position we are in, so it's about everyone rolling up their sleeves and showing what they're made of." Senior players Rob Hopley and Mike Lea had been in temporary charge since Hoskin's departure on 10 October. "I'll be relying heavily over the next couple of weeks on Rob Hopley and Mike Lea, who know the club inside out and have been through good times as well as bad," Lynch added. "But I will be looking to bring somebody else in to help me and I am currently in talks with a couple of people who on my wavelength and work the way I like to work."